In the About unit, I remarked that the Waddells are plain folk and that none of us came over with the Conqueror. And that is true – there was no boatful of Waddells charging up the beach at Hastings shouting "Mort aux Anglais" or "Last one to slay a Saxon's a sissie". And in part, that's because the surname Waddell did not yet exist. Neither, in fact, did surnames in general. The only form of identification (apart from the Christian name) was a territorial title or seigneury such as Duke William of Normandy, Count Eustace of Boulogne or William Malet, Seigneur of Graville. And unless you had such a distinction, your part in the battle, however valiant, would not be recorded or remembered. And even if you did have a title or honorific, that didn't guarantee that you would be recognised by posterity. The only individuals universally agreed to have taken part are the fifteen so-called "Companions of the Conqueror". "Many ancient English families of Norman origin have claimed amongst their ancestors a participant at the Battle of Hastings as a matter of great pride …. The large majority of these claims are based on legend and cannot be proven by historical evidence. Many hundreds of Norman nobles of varying degrees certainly fought with the Duke at Hastings, yet the fact remains that the names of only 15 of these are recorded in contemporary historical sources considered to be unimpeachable. This very select group is therefore known as the "Proven Companions …"
Eustace of Boulogne's part in the battle seems to have been equivocal at one juncture, when he appears to have urged William to retreat, or at least to regroup. But William of Graville evidently emerged with flying colours, and was tasked by the Conqueror (as William now was) to dispose of Harold's body in a seemly manner. But why, it might be asked, are the two names (2) and (12) out of this illustrious fifteen singled out for especial attention? The answer is, that, risible and absurd a pretension as it may seem, the descendants of the two individuals eventually intermarried and after a pause to get their breath back, started a steady relocation northwards to Scotland, where through an admittedly fortuitous similarity in their burgeoning surnames found common ground with the local de Wedales as newly-minted Waddells. The idea isn't mine, and two highly-respected researchers in Waddell family history will have nothing to do with it, and yet, ever since I started to look into it, the strength of the narrative has increasingly impressed me. It's just that final quantum leap to Scotland that is uncertain. The originator of this scenario is in fact Caroline Wilfreda (Freda) Bingley, née Waddell, who first contacted me about it in Jan 2013. She has spent a good many decades in painstaking first-hand research in Ireland, England, Scotland and France, and has amassed a vast documentary archive. And, not surprisingly therefore, it's taken me a while to assimilate all the historical details and family lineages involved, and present them in a format consistent with all the other Connections on this website. Freda really hits the ground running with her thesis that the precursors to the Waddells arrived with Guillaume le Bâtard, and assembles a great deal of preliminary detail – in a very engaging and thoroughly enjoyable personal narrative – but I'm not sure that all the strands of her story are then united convincingly. The fault probably lies as much with me as it does with Freda, but let me summarise her propositions as follows – the words are mine but the context is entirely Freda's, except for links to Wikipedia inserted editorially and extracts from the internet to provide further background material to support Freda's contentions. The descendants of these two proven companions of William were eventually to unite in marriage a century and a half later, when Sir Walter III de Wahull married Heloise de Vivonia, née Malet, as outlined in the following tabulations of their family backgrounds. It is a pleasure to acknowledge www.mallettfamilyhistory.org, the superbly organised website from which almost all the following information has been reproduced. Dates given in red are estimated. The details of the Vivonia / Vivonne Connection are reproduced from our-royal-titled-noble-and-commoner-ancestors.com/p381.htm. The Malet family's heraldic identification with the buckle (fermail) has been explained with reference to the diminutive form (fermaillet) – not a particularly impressive pun by modern standards perhaps, but sufficient in those days to give them proprietary rights on their famous triple-buckle armorial ID. Freda: "Every family in Europe that I come across using heraldic buckles go back to one family – that of William Malet, the commander of the Norman soldiers at the Battle of Hastings"
OrnaVerum: "It has suddenly dawned on me that the really significant, game-changing, charges on a coat of arms are not the ordinaries (ie the chiefs, fesses, saltires etc) but the subordinaries (the buckles, suns, crescents, scallops etc) – it is the latter in particular that identify two apparently distinct coats of arms as having a familial connection. The critical importance (for the nascent Waddell family name in the Scottish Border area of Wedale) of the matrimonial and heraldic union of Heloise de Vivonia with Sir Walter III de Wahull in the early/mid 1260's, is that she acted as a conduit for the Malet buckles into his coat or arms, displacing the Seton crescents, and pointing the way ahead to the 'Waddell' arms as displayed in the Heraldic Footprint section." Most of these details are reproduced (after cross-checking) from Wikipedia. The rather counter-intuitive intricacies of Seier and Walter de Lens' family fortunes are reproduced from www2.thesetonfamily.com:8080/directory/seier_de_seton(1).htm. [Gold with three red crescents] Seier de Seton??? * Interestingly, this was probably not his actual forename, as 'Seier' is Scots vulgo of French 'Seigneur' (ie the Seigneur of Seton). On the other hand, at least one of his Wahull descendants was baptised as Saher, so Seier may well have been an early example of rank as praenomen (given or adopted) – we nowadays happily refer to American Big Band jazz artistes Ellington, Basie and Hines as Duke, Count and Earl respectively! But more importantly, what was the territorial significance of Seton? 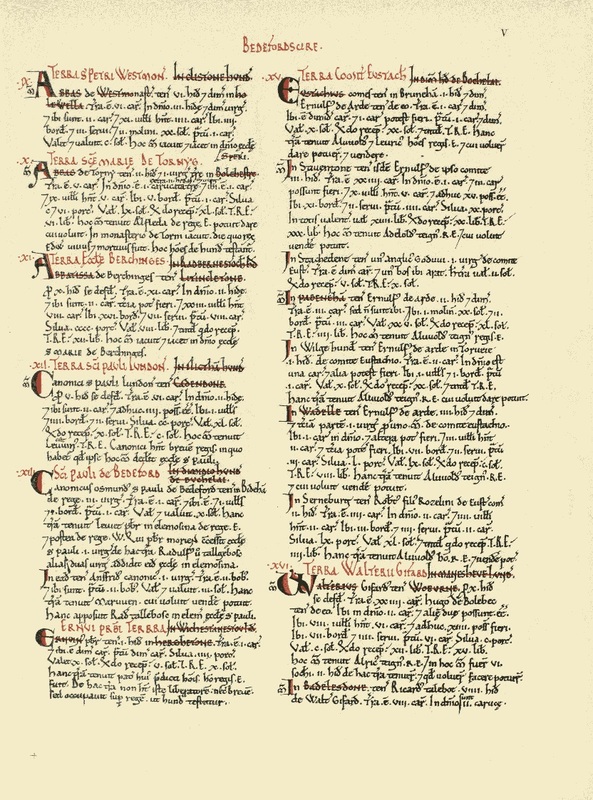 Seier's father Eustace, brother Walter and he himself had all been granted English estates following the Conquest, as subsequently registered in the Domesday Book of 1086. 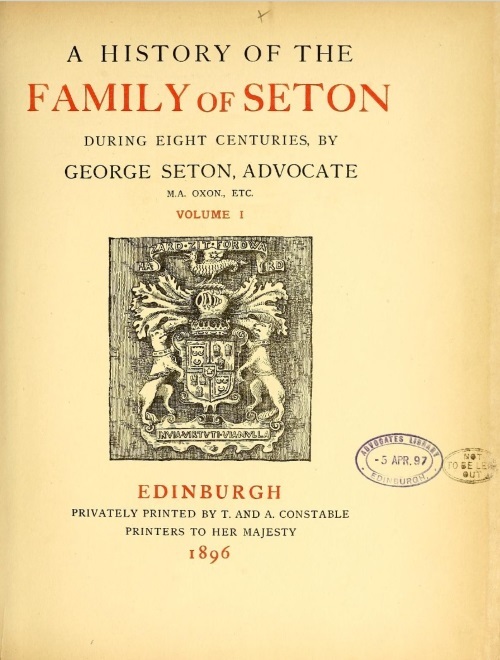 But (to cut a long story short) the Seton estate was actually in Scotland and was granted by King Malcolm III of Scotland (father of King David I of Scotland) to Seier after the latter had fled northwards in the late 1060's after a military misadventure had brought him into serious disfavour with William I of England. As far as I know, Seier hunkered down in Seton permanently, leaving his eldest son Walter the Fleming to take care of the Odell estate in Bedfordshire. From this table we see that Seton (in modern East Lothian) and Odell (in modern Bedfordshire) were two poles of the same familial axis. To quote the reference, there can be no doubt at all that [Walter the Fleming's] personal heraldic emblem, the triple crescents gules and a field or, of a second son of the Count of Boulogne, flew over both [Seton Palace and Odell Castle]. These details are reproduced from www.bedfordshire.gov.uk/ CommunityAndLiving/ ArchivesAndRecordOffice/ CommunityArchives/ Odell/ TheBaronyOfOdell.aspx. Richard Chetwood, son of Agnes de Wahull and Richard Chetwode - a minor on succeeding his mother, he alienated his Bedfordshire property to the Alston family in 1633 and died in 1635. Freda: "Any English family with 3 crescents forming part of their armorial tat I have researched go back to a marriage to a de Wahull – later this became Wodhull"
These details are reproduced from 'Parishes: Odell', A History of the County of Bedford: Volume 3 (1912), pp. 69-76. www.british-history.ac.uk/report.aspx?compid=42385. From: 'Parishes: Odell', A History of the County of Bedford: Volume 3 (1912), pp. 69-76. URL: www.british-history.ac.uk/report.aspx?compid=42385 Date accessed: 10 May 2013. Freda: "It is hard to pinpoint who it was in the de Wahull family who went to Scotland … it could have been a descendant of John de Wahull who married de Pinquinay. Firstly he could not use crescents even with a variation as by then they may not have known of the relationship with the Setons. However he could use [Arms] based on heiresses in his family … Mabel Malet and Heloise de Vivonne." The diffusion of the Odell / de Wahull descendants southwards to (eg) Kent and northwards to Scotland is evidenced by the following tabulation of Freda's personal observations. The full effect of such an osmotic drift northwards, though doubtless genuine enough, could only have been accomplished over many generations, and I would like more emphasis to be placed on the powerful Flandrophilic effect of Seton Palace and its surrounding enclave of the Seton family, upon the Wahulls of Bedfordshire. The Setons and Wahulls were close kin genetically and heraldically, and doubtless there must have been many a purposeful journey northwards to seek the new opportunities of patronage afforded by the marriage of Seier's step-niece Maud to King David I of Scotland in 1113, and also by the King's policy of encouraging an influx of Norman (later Angevin) barons from England to help keep control, especially of Galloway in the Southwest. See en.wikipedia.org/wiki/Castles_in_Great_Britain_and_Ireland. Click here to see the historic location of Seton Palace (modern postcode EH32 0PG) on Streetmap, and here to see the modern location of the village Stow in (of) Wedale. If you were riding northwards to Seton Palace from Bedfordshire in the twelfth or thirteenth centuries, you would be more than likely to chance upon the little village of Stow, in the Wedale valley of modern Midlothian. And if you overnighted there, got to meet the locals, some of whom (by the thirteenth century anyway) bore a toponym surprisingly similar to your own, and happened to notice how nice their maidenfolk were, you might well decide that you could travel further and fare worse. 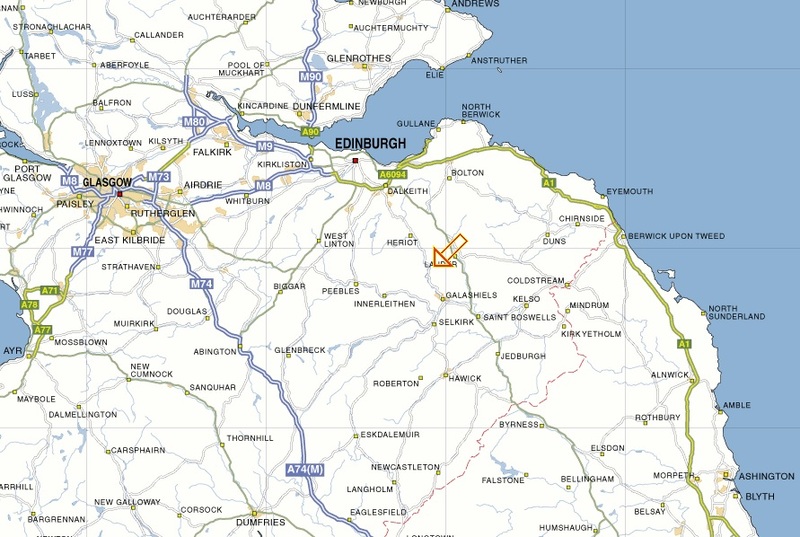 But, even more importantly, if you were hoping to be recruited by King David I, Stow was roughly equidistant from his southern seat at Roxburgh Castle, then located a few miles southwest of Kelso, as it was from Seton Palace. In other words Stow of Wedale occupied an optimal position for Wahull / Wadhull newcomers from Odell. In the box above, the idea has been infiltrated that the multiplication of the de Wedale surname, from which the modern Waddell surname then developed, was a two-tier process: organic growth from the original inhabitants of the area allied to a steady influx of outsiders with a very similar-sounding name, and an eventual conflation of the two. 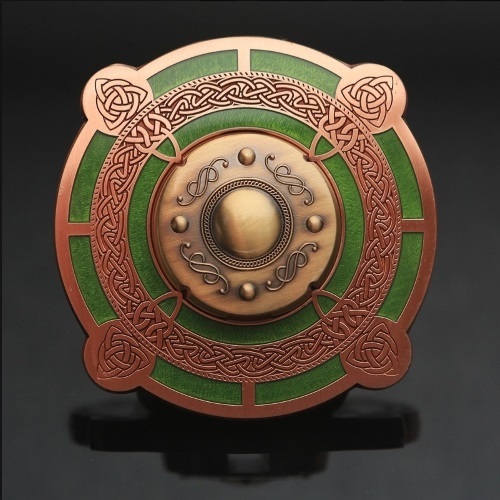 And the smoking gun as to just who those outsiders were is provided by the Maletian buckles in the coat of arms eventually granted to the family (and I still don't know when). I sincerely hope that this exposition has done justice to these ideas so enthusiastically and eloquently propounded by Freda Bingley. The evidence for and against this, and other, suggestions as to the origins and development of the de Wedale surname are admirably analysed by Gavin Main Waddell in the first chapter 'Origins of the Name' of his forthcoming treatise A History Of The Waddells Of Scotland. I'd had no particular intention of revisiting this Connection, one of my earliest efforts and even less well constructed than my later efforts though it is, until Freda Bingley's most recent letter (Dec 2016) kick-started a few dormant neurones, the result of which was the Stow of Wedale section below. From that beginning naturally followed the Odell section. 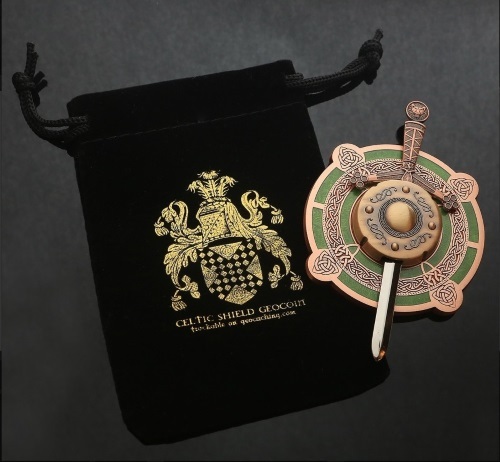 Plus a couple of nicely decorative sections on the armorial side, Geocoins and Coaster. I've always found it difficult to engage in issues where there is evident ill-feeling on at least one side of the contention or dispute, and I'm reluctant to throw another ha'penny into the hat of either side. The debate could be provocatively billed as Stow versus Odell, or Wedale versus Wahull. I myself suggested a possible synthesis of both, as outlined earlier in this Connection, but found no takers. Gavin Waddell A cites Black's surmiseB that our surname originates from Norman and Angevin incursors who settled in Stow of Wedale after 1066, possibly encouraged by King David I's radical reshaping of the Scottish constitution, as against Bardsley's thesisC, supported by Freda Bingley née Waddell, that it originated from Flemish allies of the Normans, newly based in Odell, whose surname evolved accordingly as the younger sons subsequently migrated northwards to seek advancement under David I's enlightened rule (1124 onwards). A A Gavin Main Waddell, A History of the Waddells of Scotland; privately published, Vol 1 2014, Vol 2 2016. C Charles Wareing Bardsley, A Dictionary of English and Welsh Surnames; 1901. I don't hugely care either way, myself, but I do like to see fair play. The debate is considerably complicated (or from Freda's point of view enriched) by the involvement of a third location, Seton, and I think this might be a good moment to unveil a graphical representation of the rather clunky tabular format used earlier (I've also revised and expanded the layout in a couple of the related entries in that table). It's very hard to distinguish between different people of the same name (all Christian names only, of course) and/or toponymic allegiances ("of" somewhere or another) and/or soubriquets (at least one, and possibly more, of the early Seton family were nicknamed "Dougall", for example, simply meaning "the dark stranger" – swarthy of complexion perhaps, or whose armour had an unusually high carbon content). On top of that there seem to be very few Regnal Era dates to go by, let alone Common Era dates, though of course these are easily interconvertible. To expand on the very sketchy narrative provided earlier, the story goes that Seier de Lens and Walter de Lens, the Flemish nephews of Eustace II of Boulogne, were brought to England in 1066 but were too young (still in their early teens) to take part in the battle itself. In 1067, however, there was an uprising in Kent in protest against the tyrannical and rapacious regime of the odious Bishop Odo, the Conqueror's half-brother, and uncle Eustace was persuaded to take the part of the insurgents. Seier was now old enough to become actively involved, and when the insurgency subsided he was also wise enough to flee north to Scotland to escape the wrath of Odo and William. 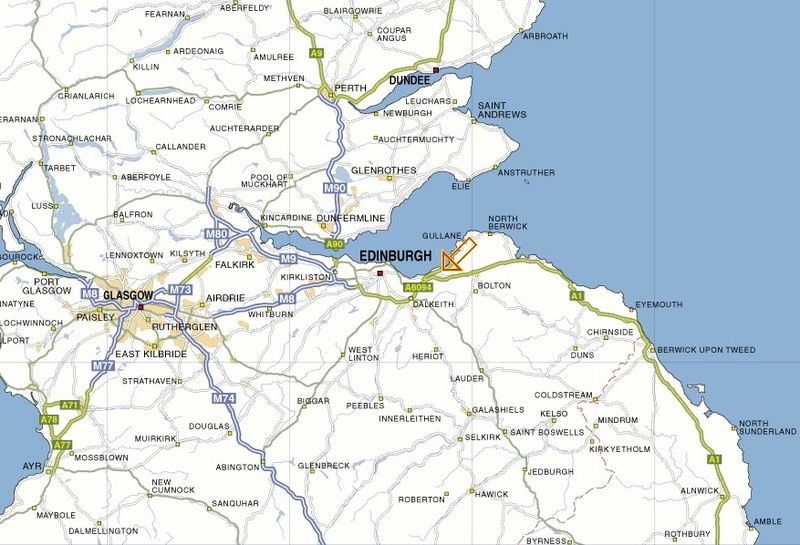 He seems to have made a good impression on the Scottish king Malcolm III (r 1058-1093) and in due course was granted an estate on the south side of the Firth of Forth, where Port Seton is now located. It seems highly plausible that it was this new arrival who first gained the nickname of "The Dark Stranger". But those who insist on hard facts would find his credentials pretty flimsy. The following source is helpful and supportive, though to whom does the pronoun "he" necessarily refer in that final sentence? 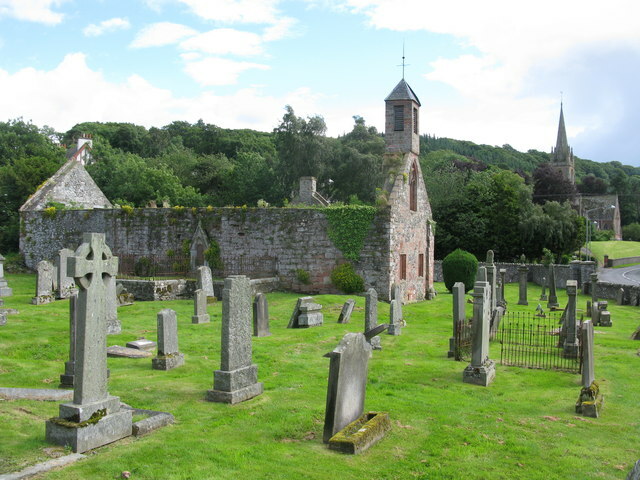 About 1159 AD Walter de Lindsay II granted the church of Earlstown in Lauderdale to the Abbey of Kelso – for the soul of Walter the English, his brother-in-law. Walter the English was the English-born son of Walter the Fleming, of Wahull, (Bedfordshire) and Seton (East Lothian). He too was a grandson of Count Lambert of Lens; he was also nephew and protector of the Countess Judith, and cousin and guardian of her daughter, Scotland's Queen Maud. But the following (to me) sounds like high-flown froth (spindrift indeed, as per Florence Craye) and just doesn't relate to the price of fish. It's included just to indicate what one's got to beware of. The family was Flemish, descending from the castellans of Cambray, of whom Walter de Lens is mentioned in the Chronicle of Baldric of Noyon, c. 950. Walter II, his son, was castellan of Cambray, c. 990, and had Walter, who was succeeded by his nephew Walter D'Oissy, castellan, in 1049. He had Hugh, father of Hugh II, viscount of Meaux, living 1096. Walter de Cambray, or D'Oissy, surnamed "le Flamand," a younger brother, came to England at the conquest in 1066, and was a great Domesday baron in Buckingham, Hertford, and Wadhull in Bedford, where he had his chief seat. MM. Lechaude d'Anisy et de Sainte-Marie, in their Recheyches sur le Domesday, state that Robert d'Armentieres and Adelolfus de Mert from the town of Armentieres in Flanders came to England under his banner, he being their suzerain. From Walter descended the barons of Wadhull and the celebrated earl of Strafford. The Wentworth family also descended from him. Mr. Edgar Taylor, in his 'Wace', likewise registers the opinion that he was at the conquest. Six of the name appear on the Dives roll. And the following, though well-meaning, just doesn't compute at all. As the builders of Winton, their history can be traced back to 1050 and Robert FitzPicot de Say, Lord of Aunay (Normandy), whose son, also Robert, fought at the Battle of Hastings with William 'the Conqueror' in 1066. 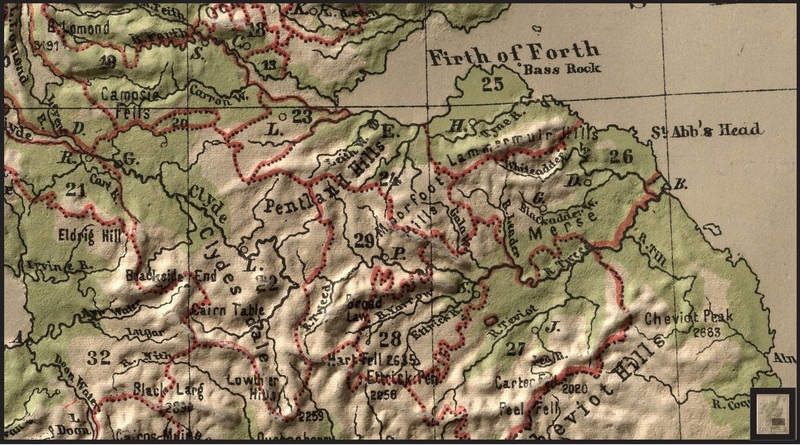 Phillip de Sayton, his grandson, was granted the lands of Seton, Winton and Winchburgh around 1150 by David I of Scotland, who was consolidating his power around Edinburgh with Norman nobles. There began almost six centuries of Setons at Winton. Much more to the point is (as indeed the parent website is so often, lang may its lum reek) the following – pretty well in accord with 'my' version. As their own distinctive crescents show, Seier de Seton and his brother Walter sprang from a second son of the house of Boulogne. Known in their Flemish homeland as Seier and Walter de Lens, they were sons of Count Eustace's second son, Count Lambert de Lens, whose daughter by a second marriage (to the sister of William the Conqueror) was the Countess Judith, mother of Scotland's Queen Maud. Seier's eldest son, Walter de Lens, or Walter the Fleming as he is described in Domesday, had his chief English home at Wahull (now called Odell) in Bedfordshire. On the Firth of Forth, as heir there of his father, Seier, he was called Dougall or "the dark stranger", a nickname which was also given to his own son Walter, and duly recorded by the family's first official chronicler, Sir Richard Maitland of Lethington, in 1554. In both Scotland and Bedfordshire, and no doubt in the lost Yorkshire home of the family, Seier de Lens (or Seier de Seton) and his descendants kept as princely an establishment as they had enjoyed in Flanders – a fact attested by a curious documentary survival. As if he had been a king, Walter de Wahull had tenants-in-chief, each with his own tenants. The terms these courtiers enjoyed on his estates at Odell are known, and although the relevant Scottish documents have not survived, it is certain that the Seton tenants on the Firth of Forth had been given similar privileges. The Victoria County History for Bedfordshire records, not without astonishment, the fairy-tale rents paid by Walter's knightly tenants in that county as "a rose, an arrow, a handful of rushes, capons, wax, a pair of gloves ...". Lesser tenants paid more; the cottager William Prikeavant provided a hooded falcon, while Walter le Sergeaunt, keeper of the park at Odell Castle, held his cottage by the service of twelve arrows. At the neighbouring Little Odell Manor, whose Domesday tenant-in-chief was Walter's great-uncle, Count Eustace II of Boulogne, the tenancies granted to Eustace's own attendant knights were similar, "a garland of roses, a bundle of rushes, a cake of wax ..."
Of the Seton family, The Great Historic Families Of Scotland says: 'The Setons are among the most illustrious of the great houses of Scotland, conspicuous throughout their whole history for their loyalty and firm attachment to the Stewart dynasty, in whose cause they perilled and lost their titles and extensive estates.' The family's founder, Seier de Seton (or de Lens), had been granted lands in East Lothian to which he gave his own name. 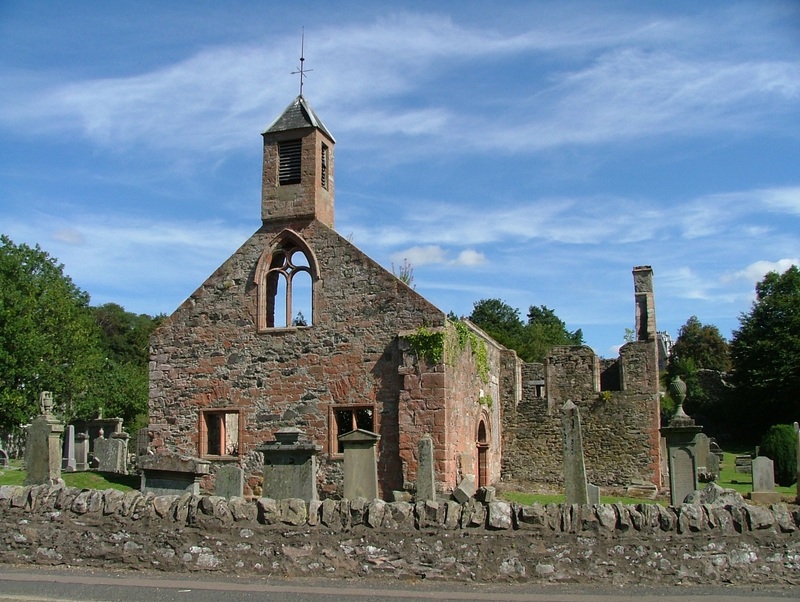 His son, Walter de Seton (also called Dougall), married Janet de Quincy, hieress of that once powerful family, and gained the lands of Tranent bordering his own. 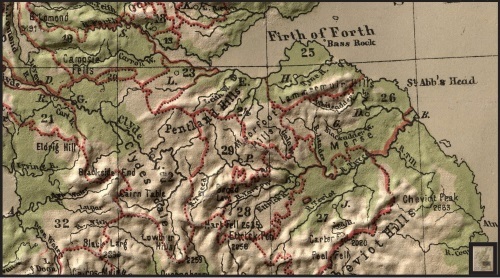 He also acquired the lands of Wynchburgh, West Lothian. 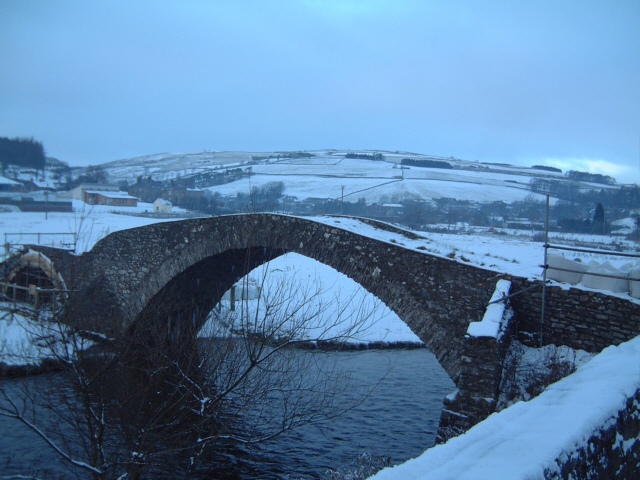 The family continued to marry into powerful alliances and later Sir Christopher Seton (Sir Chrystell) married Christian Bruce, sister of Robert the Bruce. After his legendary support of his brother-in-law he was captured by the English, taken to London, then executed at Dumfries. One of his brothers, Sir John Seton, shared the same fate. Alexander Seton, Sir Christopher's son, survived the Wars of Independence to be a signatory of the Arbroath Declaration. 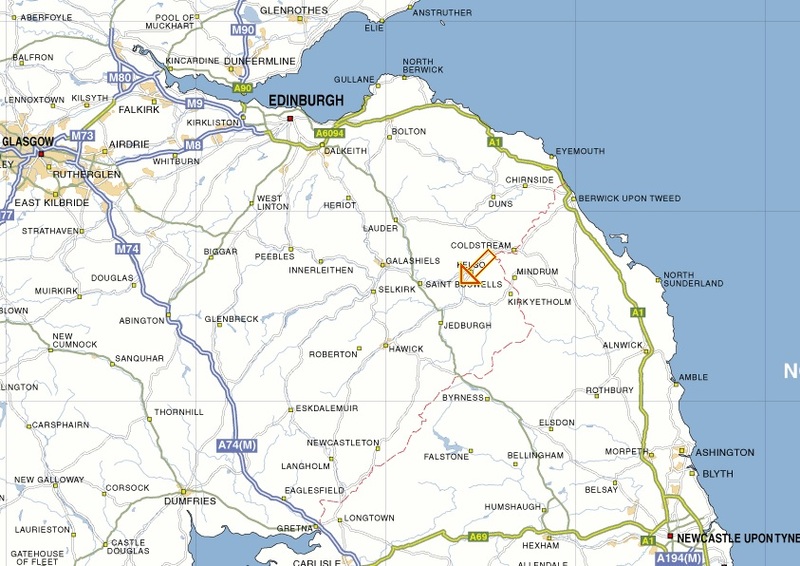 He also was a recipient of King Robert's gratitude towards the family: the existing Seton lands were enlarged by means of adding those confiscated from Anglo-supporters, and a large stretch of East Lothian coastline became Seton territory. Janet de Quincy ought to emerge as a reassuring waypoint but sadly her provenance is nil – a shady lady, unfortunately. Equally disappointing are the Seton family themselves, whose family details I heavily relied upon originally, but whose website appears (Jan 2017) to have gone off-line. So for want of better, or perhaps for lack of worse, we must consult the following source – as almost always, the author's introduction is well worth the effort in itself (please note his reference to the potato). 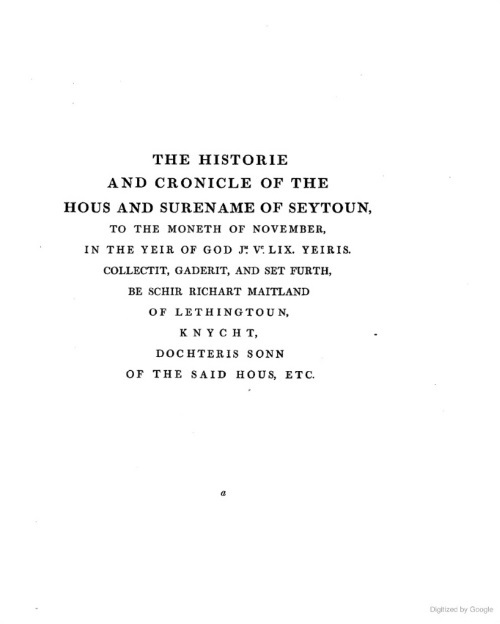 George Seton was of course well aware of, and conversant with, the work of his illustrious predecessor Sir Richard Maitland, who described himself as a "son of a Seton daughter", and with those credentials presumably having ready access to the Seton family archives at that time (as an aside, the date JM.VC.LIX on his title page is a most unusual numerical construct – intermediate between Roman and Arabic: the JM meant one (J) thousand (M), the VC meant five (V) hundred (C), and the LIX meant fifty (L) and nine (IX), so 1559 in total, which in traditional Roman form would of course have been MDLIX (J and I being more or less equivalent). This is a wonderfully ancient source in old Scottish dialect, which once you get a bit of practice is not too difficult to get the gist of. Unfortunately it doesn't seem be available as an Archive facsimile page-turning version, though both paperback and hardback modern reprints are available, as per the website given above. Another reference I've come across may well have some merit, though depends heavily on the now vanished Seton family website. And finally, a possibly helpful insight into that enlightened monarch David I of Scotland. His motto appears to have been "We are open for business". David I or Dauíd mac Maíl Choluim (Modern: Daibhidh I mac [Mhaoil] Chaluim; c. 1084 – 24 May 1153) was a 12th-century ruler who was Prince of the Cumbrians (1113–1124) and later King of the Scots (1124–1153). The youngest son of Máel Coluim III (Malcolm III) and Margaret of Wessex, David spent most of his childhood in Scotland, but was exiled to England temporarily in 1093. Perhaps after 1100, he became a dependent at the court of King Henry I. There he was influenced by the Norman and Anglo-French culture of the court. When David's brother Alexander I of Scotland died in 1124, David chose, with the backing of Henry I, to take the Kingdom of Scotland (Alba) for himself. He was forced to engage in warfare against his rival and nephew, Meal Coluim mac Alaxandair. Subduing the latter seems to have taken David ten years, a struggle that involved the destruction of Óengus, Mormaer of Moray. David's victory allowed expansion of control over more distant regions theoretically part of his Kingdom. After the death of his former patron Henry I, David supported the claims of Henry's daughter and his own niece, the former Empress-consort, Matilda, to the throne of England. In the process, he came into conflict with King Stephen and was able to expand his power in northern England, despite his defeat at the Battle of the Standard in 1138. I've strayed a long way from Wedale. 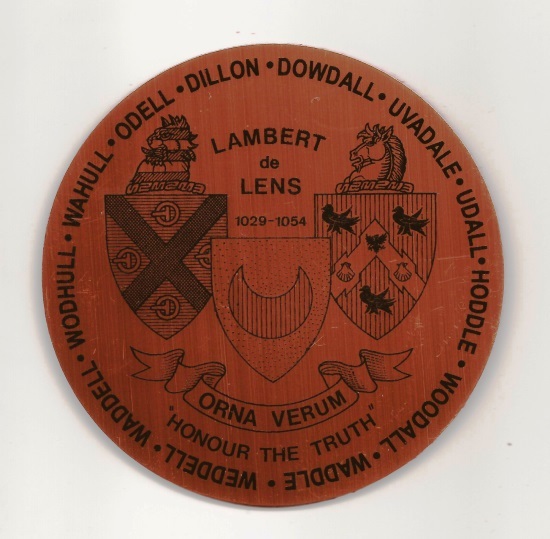 In summary, I'd rather like the colourful version that involves all three of Wedale, Odell and Seaton to prevail, but it does present the obstinate difficulty of how the buckles infiltrated the coat of arms and supplanted the crescents. Freda does provide an answer of sorts, but I think it needs to be tightened up considerably. Whatever may be the final consensus as to the origins of the surname Waddell, it seems likely that agreement has been reached as to the origins of the toponym Stow of Wedale, more commonly known just as Wedale. The Gala Water (An Geal Ath in Scots Gaelic, possibly meaning "The White Fording-Place") is a tributary of the River Tweed, which reaches the sea at Berwick. The local authority Parish of Stow stretches from Crookston (near Heriot) to Bowland, and has two main centres of population: Stow and Fountainhall. Stow, or more properly, Stow of Wedale is a small village nestling in a bend of the Galawater valley in the Scottish Borders. Various explanations have been given for the name of the village; until recently it was accepted that Stow came from the Anglo-Saxon for a stockaded place and Wedale described the country of the Goidel – an old British tribe who lived in a wide expanse from Wales to the river Tay. But it is more likely that the name means The Holy Place in the Valley of the Shrine (wiche meaning "shrine" and dale meaning "valley"; wiche dale = "wedale"). This definition takes us back to St Mary's Well which stands just to the south of the village. Fountainhall – with a population of 280, Fountainhall is a small community with its own school and village hall. It supports a thriving WRI and is strongly linked to the farming community. 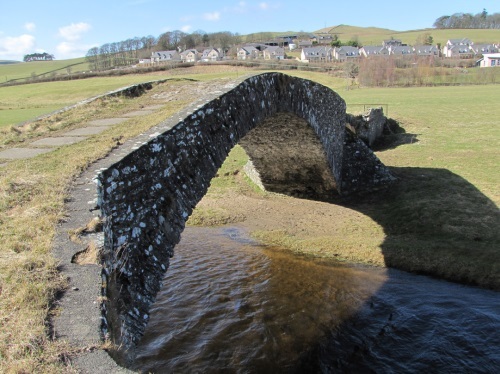 Lying just a couple of miles to the north of Stow, Fountainhall comes together with Stow as one community enjoying many social and economic links with Heriot and Galashiels. The previously popular derivation of 'We' was from the Latin word Vae = woe, as in the phrase Vae victis = Woe to the conquered. In this case, the woe was supposedly felt by the Saxons who suffered a crushing defeat in the Gala Valley by the forces of the semi-legendary King Arthur. Another, slightly less plausible and deservedly less popular, derivation of the name Wedale as a whole, was from the pre-Gaelic Celtic tribe of Goidel, via a mythology worthy of Laurence Austine Waddell himself! 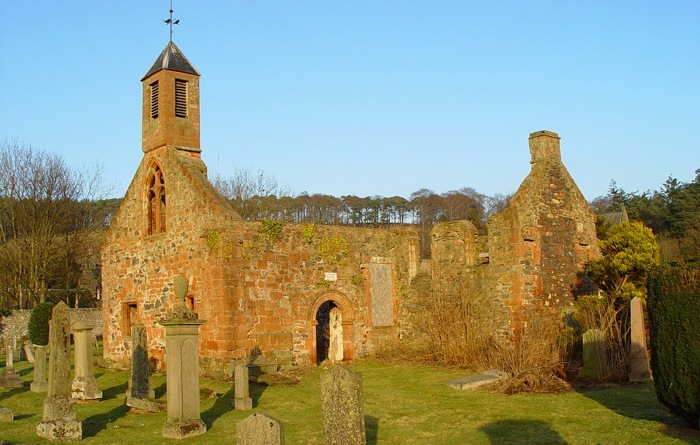 William Lamberton (Bishop of St Andrews 1298-1328) had a number of such mansions built at important locations around his diocese, to accommodate himself and his episcopal retinue during his pastoral travels in the summer months. An impressive example of late 19th century Gothic Revivial architecture, 1876, by Wardrop and Reid; the 140ft spire is a local landmark. 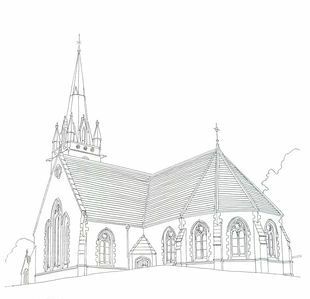 The church is T-plan with, unusually for a reformed church, an apse. The exterior has lots of Gothic detailing; the inside is enhanced by stained glass by James Ballantine & Son. 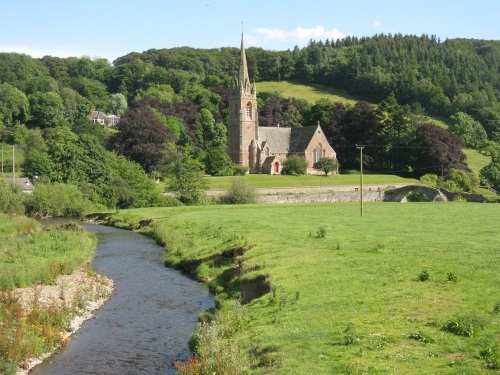 The church dominates the valley of the Gala Water, the former name of which was Wedale. The ruins of an earlier medieval church stand slightly to the north and, outside the village, are the remains of St Mary's well and a chapel which is said to date back to the time of King Arthur. The birthplace of the surname of Waddell? This beautiful picture, taken by M J Richardson, looks southwards down the Gala Water towards the church of St Mary in the village of Stow of Wedale. or slightly downstream in a summery setting (thanks to Michael Oglethorpe). 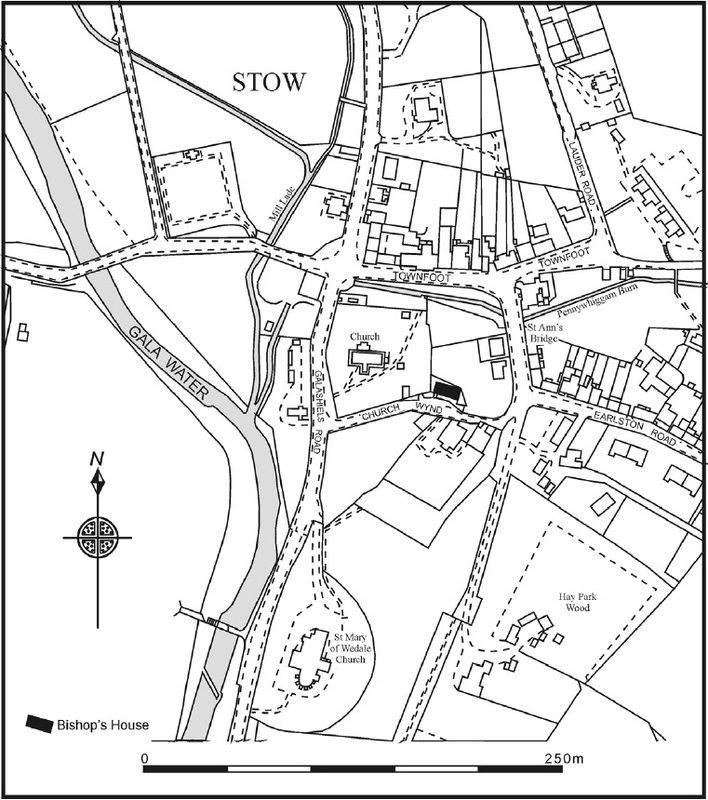 There are a number of interesting websites dedicated to Stow of Wedale, most of which overlap to some extent. Please see the following example. Stow was known then as "Stow in Wedale", and the name of Wedale described what is known today as the Gala Water. Various explanations have been given for the background to the name "Wedale" including "Valley of Woe" and the dale of the holy house to an abbreviation for the Celtic Goidel race, but it is now known that Wedale derives from 'Wiche' meaning shrine and 'Dahl' meaning valley. So Stow in Wedale means 'holy place in the valley of the shrine'. 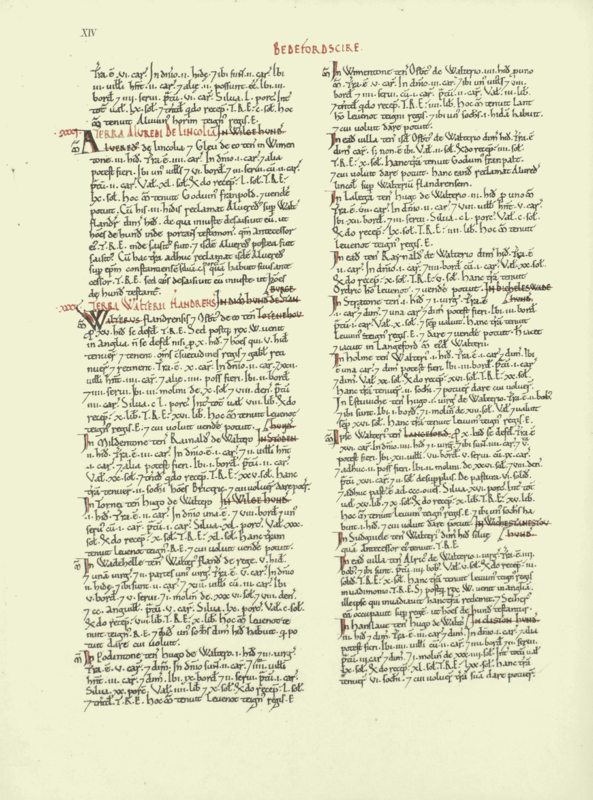 The first written mention of Wedale comes in the Historia Britonum" written by the Welsh monk Nemius in AD 826. According to Nemius, King Arthur had, in gratitude to Our Lady for a vision in which she assured him of victory over the invading Angles, caused an image of Our Lady to be brought from Cappadocia and placed in "Our Lady's House at Wedale". 'Place-Names of Scotland' by James Johnston, 1892. Wedale: ca 1160. Old English: wa-dael (in Danish: vee-dal), 'vale of woe,' so called by Angles from their great defeat there by King Arthur. Let's look a bit more deeply at what is known about the village of Odell itself – firstly from the modern perspective. We can see an amazingly close approximation to the modern surname Waddell, and a completely new derivation of it! In the early 11th century the area where the present village lies was part of five or more hides that were under Levenot, a thane of King Edward the Confessor, who owned much land. At that time the village was already known by the name of Wadelle, or Wadehelle. This name means "the hill where woad grows". Woad (Isatis tinctoria) was important as a source of indigo blue textile dye. After the battle of Hastings in 1066, William the Conqueror and his Normans progressively took control of the whole of England. In many cases regions were given to fellow soldiers to manage. The lands owned by Levenot, along with the title of baron, were passed to a Walter Flandrensis, the Count of Flanders, who is thought to have fought alongside William. Walter is mentioned as early as 1068, and sometimes as Walter de Wahul (Wahul being a variant of Wadehelle). His arrival marked the start of a period of centuries during which a family bearing an Odell-type name continued to hold most of these lands. Odell was recorded in the Domesday book of 1086 as a parish of the Hundred of Willey. Amongst the de Wahul dynasty were a number of interesting characters. 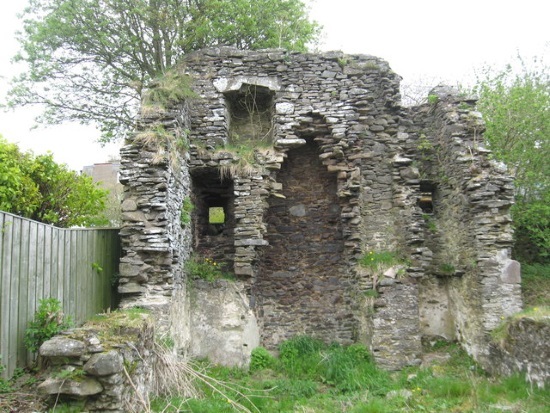 The wild Simon de Wahul was described by the Archbishop of Canterbury as an "invader" of Ramsey Abbey. It is also known that Simon sided with Prince Henry in 1172 when Henry rebelled against his father. On the other hand, Simon's own son, another Simon, was very devout. He ended up dying in 1191 on a crusade. In 1542, in the absence of a male heir, the estate came to 17-day-old Agnes Woodhall (like Wodelle this is another variant of the name). She married twice and her son by Richard Chetwood, also called Richard, became the heir to the estate on her death in 1575. About this time the village often becomes referred to as Odell. In 1613 Richard made efforts to be recognised as Baron of Odell (a claim his 18th-century great-great-grandson and 19th-century descendant also later pursued) but without success. In 1633, Richard sold the estate to William Alston and, after five hundred years, Odell village was no longer under the influence of a descendant of the family bearing the same name. Most people pronounce the village's name as "oh-DEL", like the surname. Some commentators, however, consider it should be pronounced "OH-dl", rhyming with Yodel. The Domesday Book recorded two manors in Odell. One was held by an Arnulf of Ardres (a town near Calais). He had four and a half hidesA and a third of a virgateB and held the manor from Count Eustace II of Boulogne. The manor comprised three villagers, seven smallholders and two slaves. Each of these people would probably have had a family, giving a possible total of around fifty people. Before 1066 Alfwold, a thegnC of King Edward the Confessor (1042-1066) had held the manor and it had then been worth £8. This had declined to £5 by the time Alfwold was deprived of it by the new Norman King and by 1086 the value had sunk still further to £3. This holding, later identified with Little Odell Manor may well have been in the west of the modern parish around Little Odell. The larger, more important manor, of five hides, one virgate and parts of a further virgate was held by Walter of Flanders directly from King William I. He had the manor after William deprived its Anglo-Saxon thegn, Leofnoth. 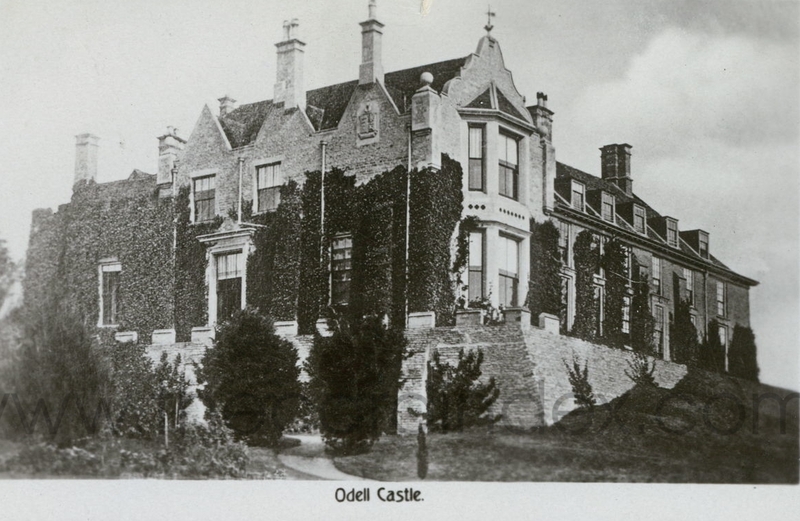 The manor contained thirteen villagers, five smallholders and five slaves - perhaps around ninety people all told, meaning that Odell probably held just shy of a hundred and fifty people - three times the size of Harrold at that date! This manor also contained a mill on the River Great Ouse worth two hundred eels and woodland for sixty pigs. In Leofnoth's days it had been worth £10, this had fallen to £8 by the time Walter was given it and it was only worth £5 by 1086. A A hide was (sometimes and somewheres) taken to be (about) 120 acres. B A virgate was (sometimes and somewheres) taken to be (about) 30 acres. C A thegn (or thane) was the Saxon equivalent of a Baron. The following extract relates to the smaller manor, held by Arnulf of Ardres from tenant-in-chief Count Eustace of Boulogne, who in turn held it from the monarch. We have be careful though – is this Walter of Flanders the same as Walter the Fleming, of Wahull and Seton? I think he was, as his great-uncle Eustace II (veteran of Senlac) had died in about 1087, his grandfather Lambert II of Lens had died in 1054, his uncle Walter (vieux Gautier) was back in Normandy, his father Seier de Lens was lurking up in Scotland during a period of royal disfavour, his brother Hugh was busy with other things, so who else was there? "So let us never, never doubt what nobody is sure about." Had you despaired of finding that special present for the outdoor-loving Waddell in your life? An Orna Verum geocoin is not only a visual delight, but is an ideal accoutrement for the adventurous activity of geocaching, a form of global treasure-hunting. Available in a variety of colours, and very attractively priced! Somewhat more controversially, Freda Bingley's very nicely designed coaster, a pair of which she sent me in 2013, reflects the dispute as to the origins of the Waddell surname. It features (centrally) the single crescent of Lambert II of Lens, together with (on the LHS) the buckles of the Waddell family, and (on the RHS) the martlets of the de Pinckney family (I'm never quite sure how relevant the latter are to this issue). Also (peripherally) the variants of the Wahull/Odell/Waddell surnames which she recognises as historically significant. 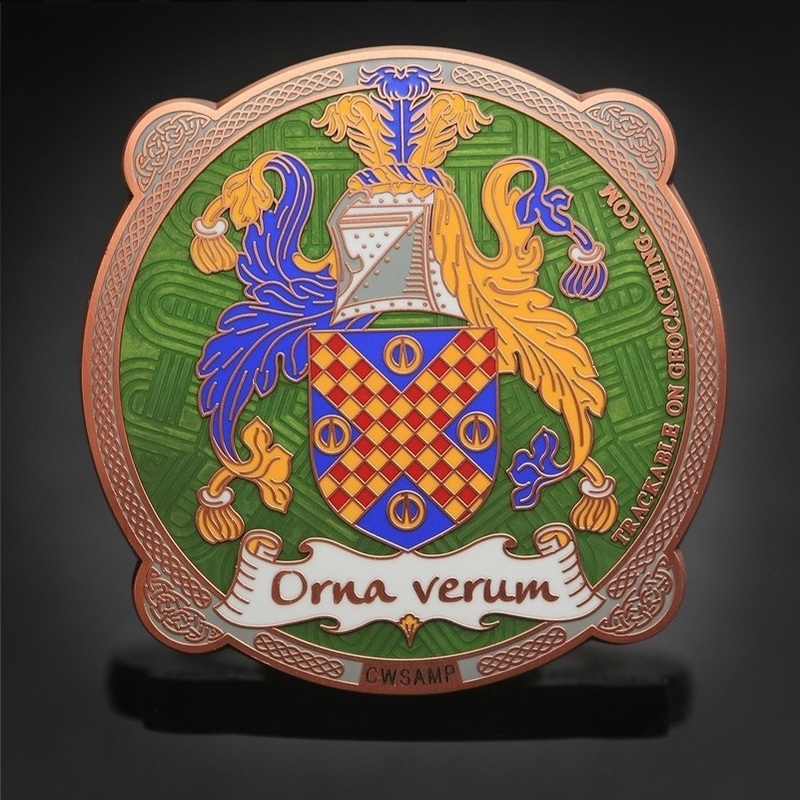 Also displayed is a nice translation of the Orna Verum motto as "Honour the truth", as per the association in English of "decoration" and "honour" – though a "decoration" is interpreted as a military award and an "honour" as a civilian award. I think the latter is a more generally accessible possibility for the majority of us.